The second in an ongoing series of atmospheric zones by master sound painter Steve Roach, Immersion:Two presents a subtle shift from the luminous steady state harmonic current of Immersion:One [Projekt, February 2006]. On this 73-minute longform soundscape, a sinuous weblike mist seems to emanate from the speakers. Mysterious yet calm, this is the perfect sound environment for the deeper hours after midnight or anytime a quiet, engulfing audio landscape is desired. If Nag Champa or Sandalwood incense has a sound this might be it. 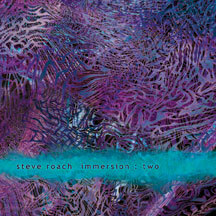 Steve Roach’s Immersion series is especially effective at low volume playback levels as the non-dynamic nature of this soundworld can support creative states, sleeping as well as reading and other functions where “music” is considered invasive (for example yoga, meditation, massage, or any other activity that calls upon the art of blending). Presented as a continuous zone with no real beginning or end, this 73 minute space is even more effective in dissolving the sense of linear time by simply activating repeat mode on the CD player and letting it play all day and night at a quiet volume level.